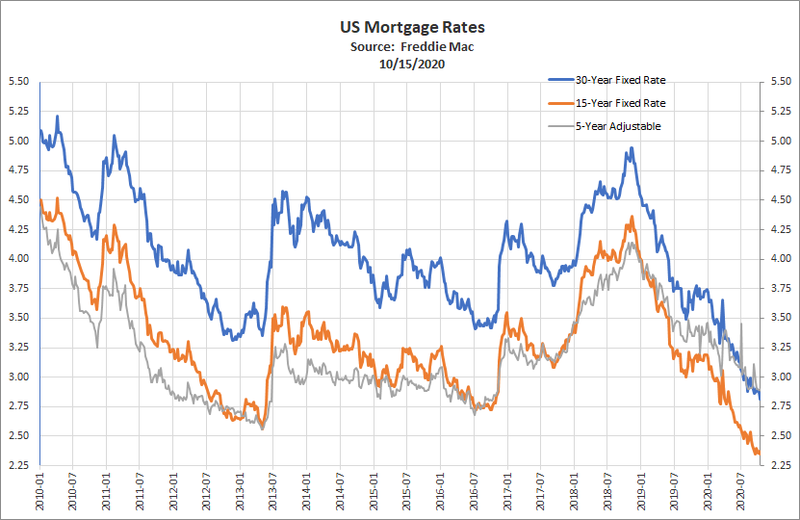 The 30-year fixed-rate mortgage (FRM) averaged 4.08% with an average 0.5 point for the week ending April 4, 2019, up from last week when it averaged 4.06%. A year ago at this time, the 30-year FRM averaged 4.40%. The 15-year FRM this week averaged 3.56% with an average 0.4 point, down from last week when it averaged 3.57%. A year ago at this time, the 15-year FRM averaged 3.87%. The 5-year Treasury-indexed hybrid adjustable-rate mortgage (ARM) averaged 3.66% with an average 0.4 point, down from last week when it averaged 3.75%. A year ago at this time, the 5-year ARM averaged 3.62%. Markets were up last week. The Down Jones Industrial Average ended up 1.91% to 26,424.99. The S&P500 ended up 2.06% to 2,892.74, and the Nasdaq Composite finished up 2.71% to 7,938.69. The annual yield on the 30-year Treasury ended up 8 basis points to 2.91%. (-) Retail sales for February fell -0.2% on a headline basis, the opposite of the expected gain of 0.2%. However, on the positive side, both January and December numbers were revised significantly higher. Interestingly, removing the more volatile components, the core/control measure ended the month with the same -0.2% result as the headline. Positive contributions originated from auto sales, non-store/online and health/personal care, while ‘misc.’ stores, grocery and furniture/home furnishings declined and detracted from the result. It appears a delay in tax refunds is being partially blamed for the slowdown, as there tends to be a close relationship between refund issuance and proceeds being immediately spent. (0) Durable goods orders for February fell by -1.6%, which was slightly less than the expected -1.8%. However, as usual, the headline monthly result largely was the result of impact from the transportation sector, where typically-lumpy aircraft orders fell by -23% from the prior month. Removing transports, durable goods rose by 0.1% for the month, while the more relevant core capital goods orders segment saw a minor decline of -0.1%, versus an expected increase of a tenth. Capital goods shipments were flat, while durable goods inventories rose by 0.3%, in addition to a few positive revisions for prior months. Overall, this appeared to be relatively neutral. (+) The ISM manufacturing index for March reversed a decline from the prior month by rising 1.1 points to 55.3, outperforming expectations calling for 54.5. New orders, production and employment all improved, further into expansionary territory, while supplier deliveries and inventories declined, but continued to expand. Prices paid also increased back into expansion in the mid-50’s. While manufacturing data can be noisy month-to-month, a bounce back into a more positive trend bodes well for overall economic activity. (-) The ISM non-manufacturing index for March fell by -3.6 points to 56.1, falling short of the expected 58.0. Business activity and new orders fell by the greatest degree, while employment activity increased. All remained in the mid-to-high 50’s, however, while supplier deliveries and new export orders fell by more nominal amounts to the lower 50’s. Overall, the report is indicative of continued strong expansion for the services segment—the largest portion of the overall economy. (+) Construction spending rose 1.0% in February, which surprised compared to an expected decline of -0.2%, in addition to positive revisions for the two prior months. Public non-residential construction represented a good portion of gains, up nearly 4% on a variety of infrastructure sub-components gaining ground. This was followed by a nearly 1% gain in private residential spending, while private non-residential spending fell a half-percent. (-) The ADP employment report for March showed a private sector gain of 129k, which fell short of the 175k expected; however, February data was revised 14k higher. Services jobs gained by 135k, with education/health and professional/business services accounting for 56k and 41k, respectively. Jobs in goods production fell by -6k, which matched the decline in the construction segment. There appear to be weather-related effects present, which may or may not be as relevant as the government report. (+) Initial jobless claims for the Mar. 30 ending week fell by -10k to 202k, below the 215k expected by consensus. Continuing claims for the Mar. 23 week fell by -38k to 1.717 mil., below the expected 1.752 mil. No anomalies were reported, with state-by-state reports relatively balanced. Interestingly, the initial claims number is the lowest since 1969, again reinforcing the persistent strength of this cycle’s labor market. (+) The employment situation report for March came in a bit better than expected, with weather effects abating, which appeared to have held back data for prior months to some extent. Nonfarm payrolls rose by 196k, compared to expectations calling for 177k. Payrolls for January and February were revised upward, but not dramatically. Service jobs rose by 170k, with gains highest in health care (up 49k), professional/technical services (34k), in addition to food/beverage (27k). On the more cyclical side, goods-producing jobs only rose by 12k, led by construction up 16k, while manufacturing jobs fell by -6k, which almost entirely consisted of autos and auto parts. The unemployment rate was unchanged at 3.8%, after ticking higher earlier in the year, and remaining below the 4.0% of a year ago. The U-6 ‘underemployment’ measure, was similarly unchanged at 7.3%, and falling below the 7.9% of last March. Despite greater recession worries based on other economic slowing, an unemployment rate that’s lower than that of the prior year has generally been a positive sign of non-recessionary impulses. The household employment survey component of this metric showed a decline of -201k workers, mostly in the self-employed category. Average weekly hours rose by 0.1 to 34.5, to make up for a decline in February. Average hourly earnings, however, rose by only 0.1%, weaker than the 0.3% expected, and bringing the more closely-watched year-over-year increase to 3.2%—still a pickup over the broader inflation rate. While this is certainly higher than the pace of a year ago, it trails the expectations of some economists who feel wages should now be growing at a faster rate late cycle. Question of the Week–Politics and Corporations (Part 2): Are political criticisms of corporate stock buybacks justified? While a far more specific issue than last week’s discussion, political figures have been making increasing noise about the trend of corporations buying back their own stock. To provide better context, it may help to take a few steps back. When the idea of a common stock company structure was created centuries ago, it was based on the idea that multiple owners could own individual fractions (shares) of a venture, and, in return for taking on the risk of failure, would receive back any proportional profits earned. However, as much as profit was a motive for investing in anything, the concept of limited liability—being on the hook for the amount one invested but no more—was as important in the development of the corporation as an entity. Traditionally, stocks are supposed to pass on any non-reinvested cash flow profits to owners, so the ventures (like ship voyages) would either liquidate when they were finished (and pay out any residual profits, if any), or remain a going concern and pay a periodic dividend. At one time, since common stocks fall lower on the capital structure than bonds, and thus have a far higher risk of going bust, their dividend yields had to be far higher than bonds to entice investors. This was true through just a few decades ago, but less so today. Assuming a profit is made, corporate managers are left with a few choices about what to do with cash flows. They can reinvest in the business (buy equipment or other capex investments, spend it on R&D, hire workers, etc. ), pay down existing debt, or pay out a portion to shareholders as dividend payments. The latter has obviously been popular due to the ‘bird in the hand’ theory—that shareholders prefer a periodic return and don’t always count on management to make the same careful decisions with retained profits as they would with their own money. The practice of paying out dividends has been ratified by studies that have shown indexes of stocks that pay dividends (when reinvested) have performed better than indexes of stocks with no payouts. There are a variety of reasons why this is the case. Generally, stocks that pay steady dividends have been of higher quality, meaning less debt, more consistent earnings, better growth, etc., and have frequently tended to be in sectors less prone to cyclicality. A fourth modern option for a company is to buy back and retire their own stock shares. This practice, other than under certain circumstances, was not allowed for most of the last century, being labeled as ‘stock manipulation,’ but again became legal in 1982 under SEC Rule 10b-18. Such buybacks reduce the amount of corporate stock ‘float’ that’s traded on public markets. The buyback phenomenon has been growing quickly since the early 1980s, with dollar amounts now practically surpassing those used for dividend payments. How do buybacks work? Here’s an example. We’ve used annual data, rather than quarterly, for simplicity’s sake. If the company implements a payout ratio of 50% of earnings, assume it can only do one of two things: (1) pay out $20 mil. as a dividend to shareholders ($2/share, or a 2.5% yield), (2) buy back 250,000 shares of stock ($20 mil./$80). Assuming it chooses the buyback option, this would reduce the share count to 9,750,000 shares. If earnings remained unchanged at the same $40 mil. in the following year, EPS would increase by 2.5% to $4.10, absent any other growth or share issuance. This may not seem like much, but for markets, it’s not trivial. That 2.5% gained from EPS growth (different from earnings growth) is equivalent to the 2.5% dividend yield the investor would have earned in cash—just paid out in a different way. As shown above, buybacks decrease the overall share count, which can boost earnings per share in the short term, without anything else needing to happen. Buyback amounts are flexible. Dividends tend to be ‘stickier,’ meaning that once a dividend policy has been announced or they’ve been increased, they’re usually kept at that level or increased at a steady rate. (Companies often pride themselves on their dividend payment history.) Dividends are often viewed as a ‘signal’ of consistency and future corporate growth. On the other hand, dividend cuts are a sign of weakness, usually resulting in a punishment of the stock price, so tend to be avoided at all costs unless a firm is so strapped for cash they become necessary as a last resort for survival. When a company cuts a dividend, the negative sentiment and second-guessing can weigh on the stock for years. Buybacks can be increased or decreased year to year, with little market reaction and little signaling effect, since the actual buyback numbers and any offsetting issuance calculations are noted deeper in financial reports. Like with dividends, if a corporation can’t earn back its cost of capital through organic capex investments (or mergers), then paying out this cash somehow is more rational than hoarding it on the balance sheet. It’s been argued that buybacks are ‘tax-efficient,’ since the payout morphs into more of a future capital gain component than an immediately-taxable dividend income component, even though corporate qualified dividends are taxed at lower rates than ordinary income. Buybacks have been used increasingly in lieu of dividends in recent years, angering many purists (and retirees), who want the cash and/or use dividend-paying stocks as part of an income-generating strategy. Taking a portion of cash profits out of the hands of shareholders and leaving it in the decision-making hands of management can increase the risk and impact of poor corporate decisions. Paying cash removes this temptation and leaves the decision for reinvestment in the hands of shareholders. The impact of buyback effects can be difficult to value, due to their sporadic nature and inconsistent payment. Dividend discount models used to value equities are based on dividends and dividend growth over time, not on less predictable buyback behavior. If companies were smart, they would buy back shares when they were cheaper, but too far often the opposite happens. In the worst case, for a weaker firm, buybacks may be one of the only catalysts keeping the stock price buoyant. Some firms will attempt to arbitrage the cost of buybacks vs. taking on more debt. So, a firm can borrow at lower interest rates, using the proceeds to purchase their own shares. While the spread may work out in the near term, taking on more debt is almost always riskier than not doing so, and results in higher leverage ratios and can lead to being assigned a lower credit rating than they would otherwise. This is likely partially related to the recent ballooning of firms in the BBB-rated segment of the market. Buybacks have been done, in many cases, to offset large amounts of stock or stock option issuance, given as compensation to management teams and employees. Businesses in ‘new era’ sectors such as technology have been notorious culprits, but it’s done elsewhere, too. This impact shouldn’t be minimized, as ‘gross’ and ‘net’ buyback amounts (after offsetting any new issuance) can be very different and dilute potential benefits. At worst, buybacks are used by less scrupulous management as a way of offsetting share dilution and covering up large amounts of share issuance to employees (and themselves). Are buybacks evil? No, they’re just a corporate tool. Technically, a company can do whatever it wants with its cash (within bounds of the law, of course, as long as shareholders are on board). Are buybacks tilted toward management? Not really, but managers often own a lot of stock and options, and are often motivated to raise short-term EPS, which can create conflicts. Winners are anyone who owns the stock, not just executives. Losers, or those who also don’t get the dividends, are also those who own the stock. Are they worthwhile? It depends. If done judiciously and smartly, they can be a flexible technique to add ‘shareholder yield,’ but the key word is judiciously. If done to offset a large amount of issued stock options under the radar or done at expensive prices, it makes sense for investors to prefer dividends. Coming full circle on the political side, aside from outright reckless behavior, incentives rather than regulation tend to be the answer. Letting regulators dictate corporate behavior can result in other side effects, which could end up being better or worse than the original problem. Will restricting buybacks push corporations to spend more on worker wages, reducing societal income inequality? Likely not. Labor markets (and demographics) generally determine wages, as opposed to corporate altruism. Restricting buybacks could have the effect of funneling payouts again towards higher dividends. However, it could also result in the unintended consequence of letting share counts grow, which could erode earnings per share. In similar fashion, it would likely reduce overall demand for equities, which could reduce trading volume and prices. It’s been estimated that the buyback effect has been substantial over the past decade—boosting yearly per share earnings by up to several percent compared to overall earnings growth—meaning a reduction in buying could lower overall equity valuations. Firms could also spend profits in other ways, such as engage in more M&A activity (where the track record has been mixed), pay down debt, or simply hoard cash in the interim. Sometimes it’s easy to lament the old days where one purchased a stock for a nice, consistent dividend, some growth in the dividend, without having to worry about the behind-the-scenes balance sheet tinkering. U.S. stocks rose for the week, with economic data coming relatively reasonable, U.S.-China trade negotiations progressing, and also the Fed seeming committed to their patient policy. From a sector standpoint, more cyclical segments, such as materials and financials, saw the biggest gains, although there was little dispersion on the week, other than mildly negative results for the outliers of utilities and consumer staples. So far for the year-to-date, every sector is solidly positive in keeping with the ‘V-shaped’ recovery, with technology, industrials and energy leading all others, and showing gains upwards of 20%. Earnings season for Q1 will be beginning next week, with expectations calling for the first quarterly loss in several years of around -4%. This should be put into perspective, though, as the comparisons from Q1 of 2018 were driven by a strong jump in net earnings due to the new tax cuts. Full year results in 2019, however, are still tempered, but a positive mid-single digits at this point. Foreign stocks fared as well as U.S. equities in the developed world, with slight outperformance by emerging markets, as the little-changed dollar played a minor role. Stronger Chinese manufacturing data boosted equities there by 5%, as well as improved sentiment across a variety of export-based economies, and no other differentiators on the week. Despite the political news regarding Brexit, markets have retained their calm, although the official departure date from the EU is this coming Friday, Apr. 12. Hopes are still high for an extension until end of the June (asked for by the UK) or for another year, as the EU has proposed. U.S. bonds fell on the week, with interest rates ticking higher along the long end of the curve, along with positive economic data. Treasuries suffered the brunt of the price impact for the week, while investment-grade corporates fared slightly better. High yield and floating rate loans fared best on the week, with positive returns. Foreign bonds fared similarly to U.S. debt, with developed market yields rising higher, and spreads tightening for emerging market debt. Spreads for emerging market bonds have re-normalized in the first quarter, moving from a ‘cheap’ over-4% level at year-end down to the mid-3’s, reflecting investor preferences again moving toward risk-taking. As we expected, the recent partial inversion of the treasury yield curve has many strategists claiming, ‘but it’s different this time.’ This is often the problem with the qualitative assessment of economic indicators. While good news is celebrated, bad news is often excused away. We won’t know if this time is ‘different’ until after the fact. But, what we do know, is that a sustained yield curve inversion has often preceded economic slowdowns and/or recessions by a timeframe of 12-18 months historically. This wouldn’t be out of line with current estimates. However, the curve has re-normalized in a positive slope. An inversion lasting several weeks would be more indicative of historical experience as a negative indicator. Real estate in the U.S. experienced another gain on the week, in keeping with equities, and led by cyclically-sensitive lodging/hotels and retail, while international real estate lagged with negative returns. Commodities gained on the week, with help from energy and agriculture, while precious and industrial metals declined. The price of crude oil rose by 5% to just over $63/barrel, which appeared to be based on a combination of demand hopes from a strong jobs report, as well as supply issues from new signs of unrest in Libya, as well as continued strain in Venezuela from power outage-based production problems.